Social media walls are popping up everywhere as grounding showpieces at events, brand headquarters and stadiums displaying user-generated content. Social walls drive content interaction, function as a conversation starter and improve engagement. They have endless possibilities, styles and functions and provide a wall of sheer social beauty. 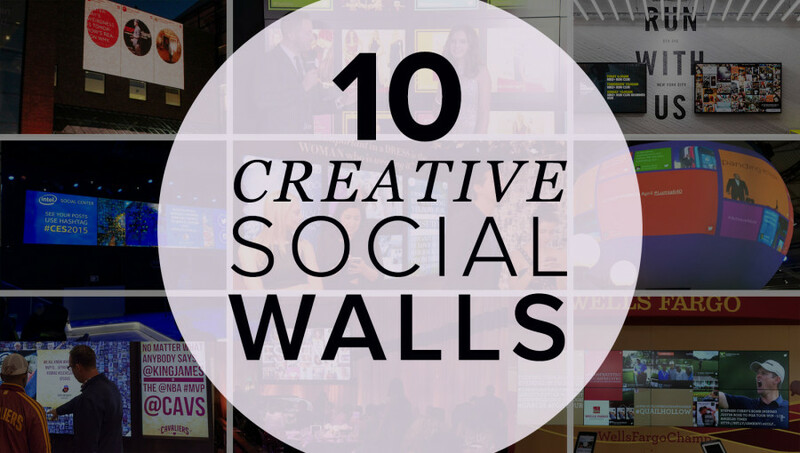 Here are ten ultra-creative social walls that are definitely social and definitely sharable. 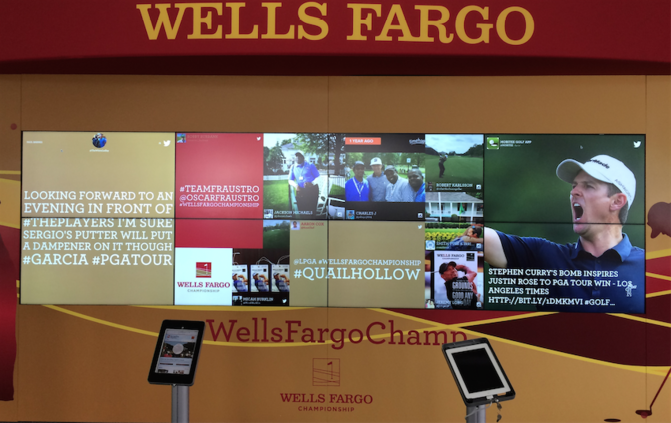 Wells Fargo wanted to do something different this year during the Wells Fargo Championship on the PGA Tour and decided to activate social content for fans to interact with in a designated area during the tournament. They built a 2-foot by 4-foot wall of screens and had styled social content as well as a voting app running during the 4-day tournament. 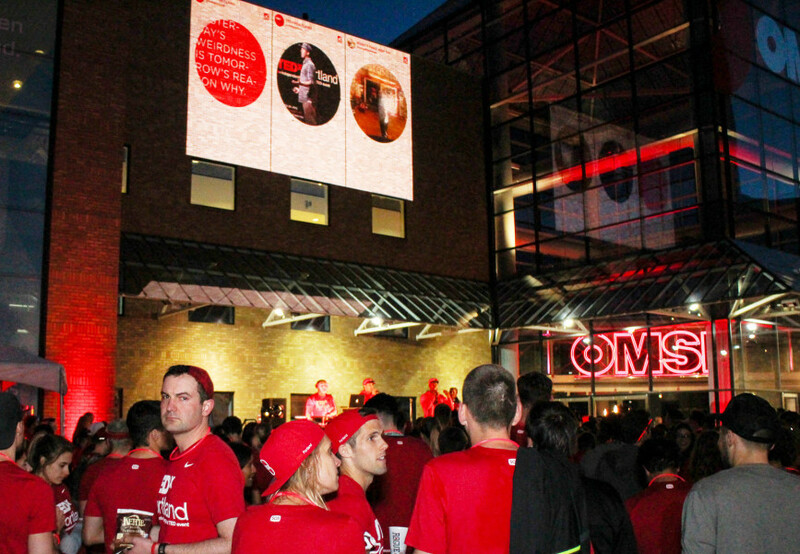 This social wall area that Wells Fargo created generated over 5,000 unique pieces of social content with over one million projected impressions for the content containing the event hashtags. 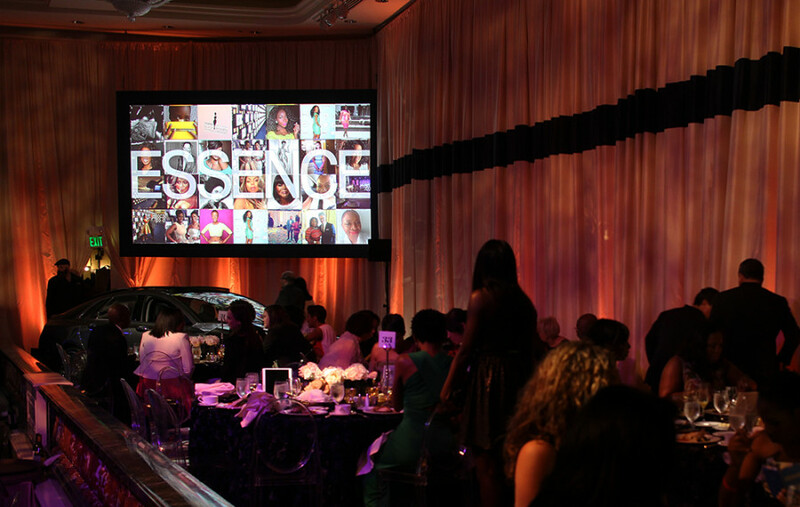 The eighth annual Essence Black Women in Hollywood Awards added another element to this already impactful event by including various large social display walls throughout the event venue where event attendees, honorees and fans could all share and interact with social content. The interaction these various social display walls provided was impressive with over 60 million projected views of social, branded, content during the one day event. The Cleveland Cavaliers just wrapped a memorable season and included in the season’s highlights was the new Q Social Zone at the Q Arena. 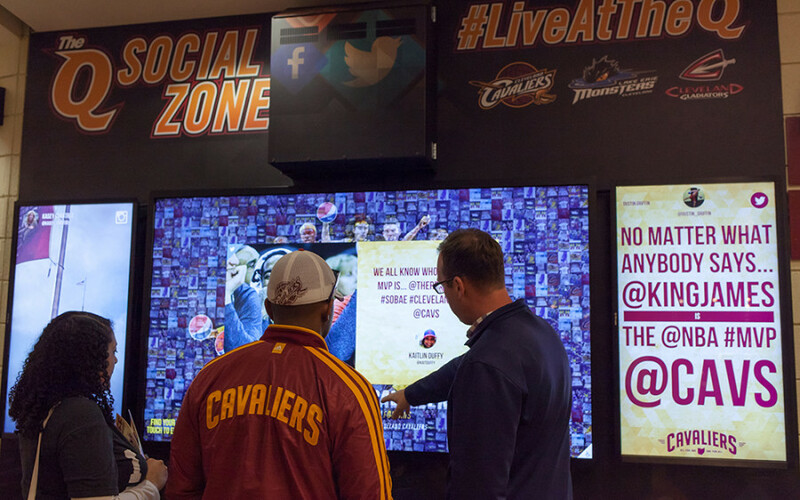 The Cavs wanted an area for their fans to connect with social Instagram and Twitter content so they installed two 46-inch vertical screens and one 84-inch touch screen on the concourse by the entrance to section 122. These social Instagram walls and social Twitter walls reflect and connect whatever event is happening in the Q Arena. The Mobile World Congress touts that if anything is happening in mobile, it can be found at MWC. 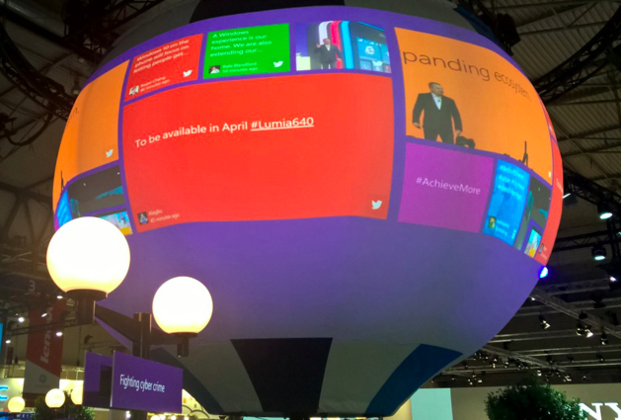 In addition to all things mobile, another thing at this year’s MWC was the Microsoft Social Balloon where they displayed the social happenings from the congress and the show floor. Besides the balloon being such a unique social wall, the styling is so on-brand and the social posts mimic the Microsoft logo and platform look-and-feel that without having to say it is a Microsoft display, fans subliminally know the brand behind the balloon. TEDxPortland, an independently organized TED event, held its fifth annual installment this year and added a new component in the form of a 6K run. Not only were runners greeted by Darth Vader on a unicycle with flame throwing bagpipes, but by a giant social display wall which was actually a projection on the exterior of the Oregon Museum of Science and Industry building. 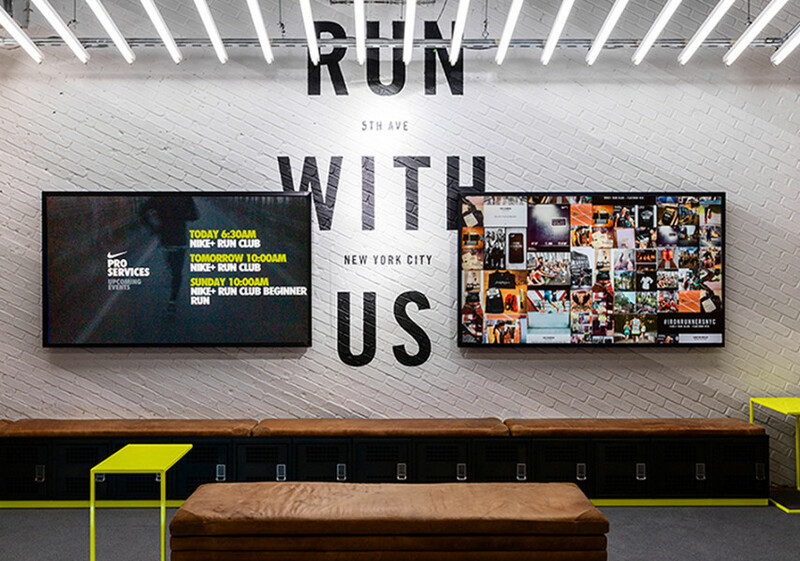 Installed in the Nike Running Flatiron store in New York City, one of Nike’s flagship locations, are two social media walls. One is a floor-to-ceiling LED screen in the store entranceway and the second is an 84″ flatscreen surrounded by Nike products. Showcasing Tweets, Instagram and Facebook posts these social walls capture the energy and foster fan participation around the Nike brand. Posts not only inspire shoppers but provide real-life, fan-generated content which advocate the #NikeRunning brand and encourage people to #RunWithUs. 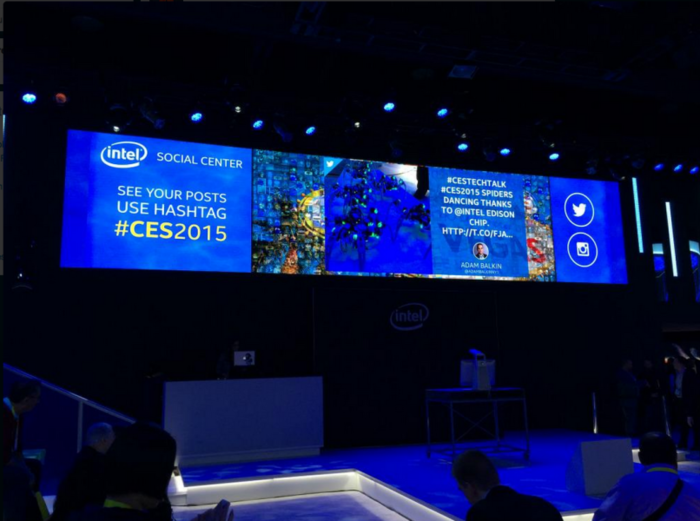 CES, the global stage for next-generation innovators, is a prime playground for social walls. 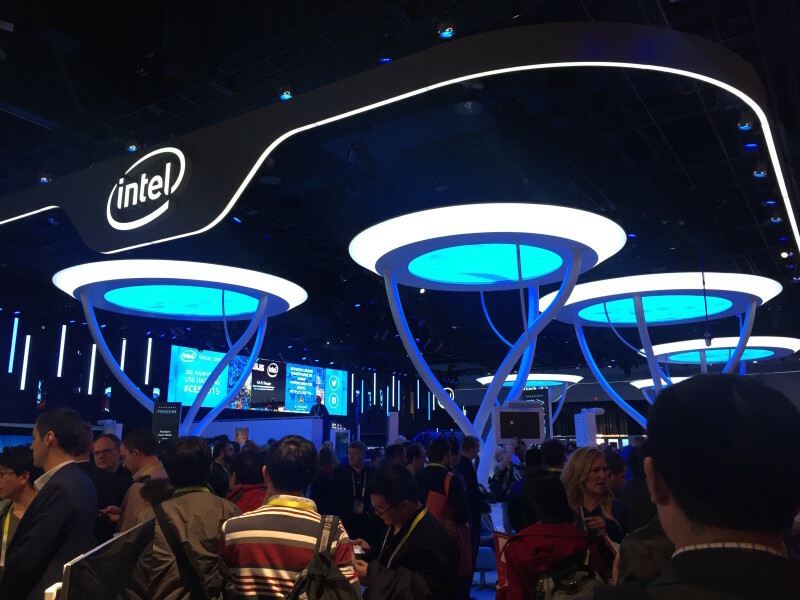 With over 3,500 exhibitors and two million net square feet of convention show floor space, exhibitors strive to outshine one another and recently, Intel did just that. In their futuristic CES booth they included a social wall displaying Instagram and Twitter content as the grounding, booth backdrop which Time voted as the most eye-catching exhibit. Fremont College has two campuses, one in Los Angeles, California and one in Cerritos, California. In addition to having separate campuses, Fremont is also aware of the growing distance between the traditional classroom and the increasingly social world outside the classroom. 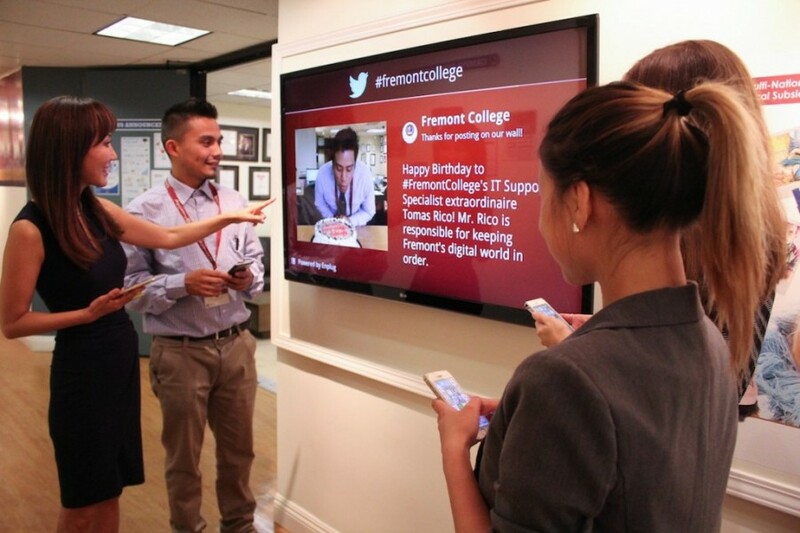 With these things in mind, Fremont College joined the ranks of creative colleges using social media and transformed their existing campus and classroom screens into social walls displaying social content. These Twitter and Instagram filled social walls not only connect their separate campuses but connect their students, their teachers and the community by bringing in social content from around the world. Award shows and red carpet events create enormous amounts of social content. The AMA Awards decided to leverage this content by creating a social media display wall as a backdrop for the red carpet. The dynamic, content-filled social wall not only provided a beautiful photo backdrop but provided real-time, relevant topics to discuss during the show. Truly connecting fans, celebrities, attendees and brands. For their 25th Anniversary, BCBG transformed their corporate headquarters in Vernon, California. The idea was to pay tribute to the past 25 years of success by taking people through a physical and visual timeline. In addition to showing off the design process, memorable ad campaigns and iconic designs, the retrospective installation included social media walls activating social content around the hashtags #BCBGx25 and #BCBGmoment. During the anniversary event BCBG saw more than 2,500 pieces of social content aggregated using the specified hashtags. Social walls engage audiences, connecting fans to brands while being show-stopping digital centerpieces. They incorporate user-generated content into physical locations, stopping people in their tracks and these ten are some of our favorites. Have you seen or attended events with social display walls showcasing Instagram and Twitter content?